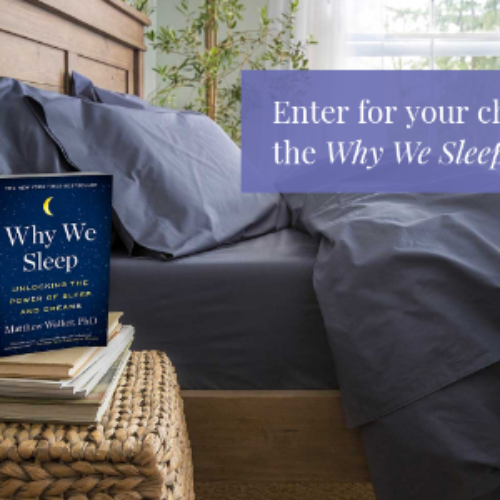 You can enter the Why We Sleep Sweepstakes from Simon and Schuster for your chance to win a sleep prize package from Tuft & Needle. The package includes a Mint Mattress, a pillow set, a percale sheet set, a percale duvet cover, a down duvet insert and more. You’ll also receive a copy of Why We Sleep. Entry ends March 31, 2019. They say, whoever they are, that we sleep one third of our lifetime. That equates to approximately 229,961 hours spent in our beds. Despite that, it’s easy to overlook just how important it is to invest in a bed that will provide a restful, uninterrupted night of sleep. Unfortunately, many people just can’t afford a top-of-the-line mattress and bedding, and that’s what makes this giveaway so awesome. If you win you’ll not only receive a high-quality mattress but you’ll also receive a sheet set, pillow set, duvet cover and more. Sleep plays a vital role in our health, and lack of sleep has been linked to an increased risk of heart disease, stroke, diabetes, high blood pressure, and more. In fact, how well and how much you sleep at night plays a direct role in your performance while you are awake. Losing just one hour of sleep per night for a prolonged duration of time can affect your ability to function physically, much less the affect it has on your attitude and mental health. It’s pretty crazy to consider, but sleep deficiency has even played a role in some major human disasters, from common occurrences like car crashes to rare events like ship wrecks, plane crashes, and even nuclear disasters! And while you may not be pulling the knobs and levers at Chernobyl, your own life can start to melt-down if you’re not getting proper sleep. I wish the best of luck to all my subscribers and fans to be the winner of this Sleep Prize Package from Simon & Schuster. Let me know in the comments section below if you’re sleeping like a baby or if you are one of the estimated 50 to 70 million Americans you suffer with sleep-related problems. PLEASE I NEED I NEED tO WIN THESE GREAT GREAT GIVEAWAY !! THAN YOU SO MUCH !LIKED SHARED AND ENTERED ! !